Having children has given me a new appreciation for the struggles parents have getting children to brush. While my kids don’t mind brushing, they do mind spending more than 20 seconds doing it! They seem to take the I-will-just-wave-this-brush-around-my-teeth-and-magically-they-will-be-clean approach. You see, they are six and eight years old and I’m ready for them to be more responsible when brushing. I’d like to send them in to brush their teeth and feel confident that they didn’t just lick to toothpaste off the brush, spit it out into the sink, and call it done. I want them to actually brush those pearly whites – each one – on each side, like Daddy Dentist is always telling them!! So when I was in Kroger the other day and spotted these Firefly Ready Go toothbrushes for under $4.00 each, I knew I should give them a try. Like any good gizmo geared for kids, they light up and come in kid-friendly designs. 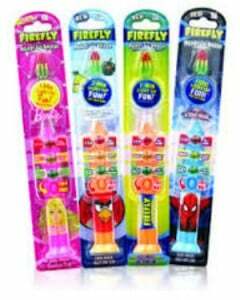 Kroger only had the Star Wars designs, but I see on the Firefly website that they now come in Barbie, Spider-Man, Angry Birds and a generic Firefly design. 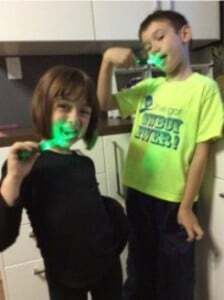 Cincinnati Dentist, Dr. Chris Omeltschenko has his kids try out Firefly Ready Go toothbrush. OK, so you might be thinking, yeah, they light up, but so what? 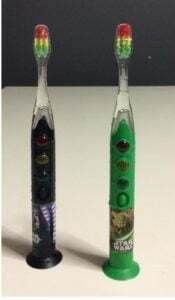 Well here’s the thing, the lights function like a stop light to get kids to brush for a full minute. When you press the start button, the green light flashes for 30 seconds, then the yellow light flashes for 30 seconds, then at a minute the red light lights up to signal you are finished. Now technically the child is supposed to brush the upper teeth for one minute, then push start again and brush the lower teeth for one minute. However, I’m going to tell you a little secret…I am perfectly happy for my children to brush both upper and lower teeth in one minute, instead of two. They’re young, their mouths and teeth are small, they have less teeth than an adult, and if I can get them to brush for one full minute, I’m thrilled! Now we do have more high-tech children’s toothbrushes in our house (the rechargeable, vibrating kind) and while they work great and can clean teeth like no body’s business, admittedly laziness has taken over in our house. We don’t always have it charged and no one ever seems to want to deal with switching out brush heads for each child. On the other hand, the Firefly Ready Go is simple to operate and affordable enough that’s is easy to buy one for each child. The packaging says that the battery lasts about 3 months, at which time you have to get a new brush. I know that my children tear up their brushes pretty fast, so they would need a new brush anyway in 3 months. I also like that the Firefly is easy to take with you, say on vacation or a trip to grandma’s house. If you’re looking for a way to encourage your child(ren) to brush for a longer period of time, I think you should give the Firefly Ready Go a shot. It has worked for us!